Hundreds of thousands of farmers have died in India, after having been allegedly forced to grow GM cotton instead of traditional crops. The seeds are so expensive and demand so much more maintenance that farmers often go bankrupt and kill themselves. “Nationally, in the last 20 years 290,000 farmers have committed suicide – this as per national crimes bureau records,” agricultural scientist Dr. G. V. Ramanjaneyulu of the Center For Sustainable Agriculture told a team from RT’s documentary channel RTD, which traveled to India to learn about the issue. A number of the widows and family members of Indian farmers with whom the journalists have spoken have the same story to share: in order to cultivate the genetically modified cotton, known as Bt cotton, produced by American agricultural biotech giant Monsanto, farmers put themselves into huge debt. However, when the crops did not pay off, they turned to pesticides to solve the problem – by drinking the poison to kill themselves. “My husband took poison. [On discovering him dead], I found papers in his pocket – he had huge debts. He had mortgaged our land, and he killed himself because of those debts,” one widow told RTD. “[He killed himself] with a bottle of pesticide... All because of the loans. He took them for the farm. He told our kids he was bankrupt,” another widow said. “He worked all day, but it was hard to make the field pay,” her daughter added. Farming GM crops in rural India requires irrigation for success. However, since rich farmers often distribute the seeds directly to the poorer ones, many smaller, less educated farmers are not aware of the special conditions Bt cotton requires to be farmed successfully. “Bt cotton has been promoted as something that actually solves problems of Indian farmers who are cultivating cotton. But something that has been promoted as a crisis solution, creates even more problems,” agricultural scientist Kirankumar Vissa said. “There are many places where it is not suitable for cultivation. On the seed packages, Bt cotton seed companies say that it is suitable for both irrigated and non-irrigated conditions – this is basically deception of the farmers,” the scientist said, adding that Monsanto also spends huge amounts of money on advertising in India, with paid for publications not always clearly marked as such. Saying that only Bt cotton is available in India, Alexis Baden-Mayer, political director of Organic Consumers Association, says this crop requires many inputs. “It is incredibly expensive; it’s 8,000 percent more expensive than normal cotton seed. But normal cotton seed is largely unavailable to Indian farmers because of Monsanto’s control of the seed market,” she told RTD, adding that India is now the fourth largest producer of genetically modified crops. 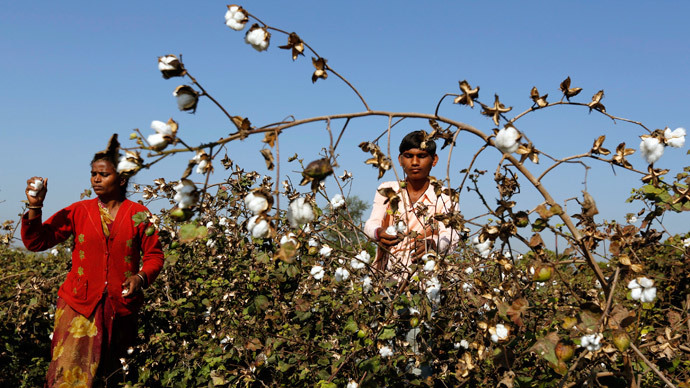 “Most countries have rejected GMOs, but India has accepted them for cotton only. And this has not worked out for the economy, and it has certainly not worked out for the farmers who are growing it,” Alexis says. “Because they have deprived the farmers of the choice of which cotton to grow, they are forcing farmers who cannot irrigate to grow a crop that requires irrigation for success,” she added.